I hope you're having a terrific Tuesday! I am just popping in with a birthday card I made for my friend Barb G of Barb's Studio Creations, Happy Birthday to yoooooo and many, many more!! I hope you enjoy your special day! If you don't know Barb, you should check out her blog where you will find gorgeous CAS card art!! There is a party going on up in this card's head. From looking at it, you won't be surprised to hear that Hammy the hamster is back from his dallydiddly in Hollywood making those Sprint commercials. Ms. Thing was able to visit for the entire last week and I'm pretty sure she went home with a lot of blingadingadoo coz the little Hammy dude came home with little empty Hammy pockets! Which is fine with me, otherwise there would be no living with a Hamster Of Means, if you know what I mean. He is back up in my head where he belongs, he is newly humbled, and he went right to work making this foo-foo fabulous party card for Barb! 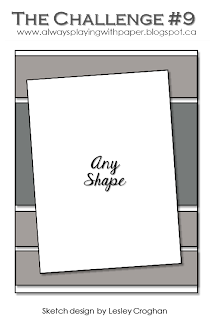 The DSP papers, ribbon, and sediment are all from Stampin' Up. The tag is from My Favorite Things "Tag You're It," the embossing powder is from Zing, and the embellies are from Mrs. Grossman, Mr. K. and my stash. 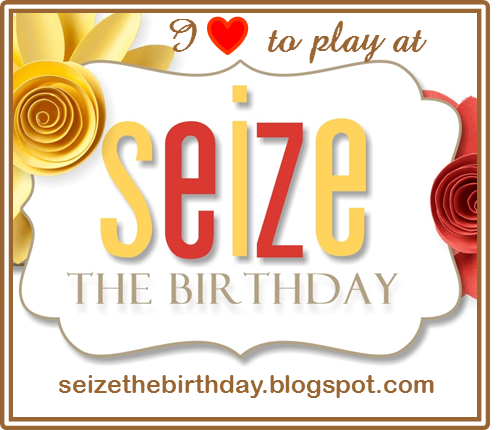 Another challenge owned by the busy Lesley is Seize the Birthday and I'm also entering my card there. The current challenge is "Anything Goes" with no toppings, so how easy is that? Make sure you pop over and enter those birthday cards you're making! The links provided will take you to the challenges where you will find the information regarding rules, sponsors, and prizes. Helen F. of Handmade Cards by Helen. Helen has been blogging since 2009. Helen is from sunny Florida and now that she only works outside the home one day a week, she has lots of time to travel and make cards. In addition, Helen loves photography, gardening, and sewing. She makes happy CAS cards and you'll often find her playing in the Make it Monday PTI challenges! Heather of Houses Built of Cards. Heather has been blogging since 2010. She is well-known in our community from her service on many design teams and she was a Stamping Royalty winner in 2014! In addition to making beautiful cards, she sells them to fund a ministry called Sister Connection which you can read more about on Heather's blog. She is a talented and giving card artist! Kathe D. of Kathe's Adventures. Kathe has been blogging since 2009. You will enjoy your romp through Kathe's blog with her wonderful card art and warm writing style! She is an independent Stampin' Up demonstrator who enjoys entering challenges where her entries are often recognized! Robin Johnston. Robin, I'm sorry but when I click on your name which is hyperlinked in the thumbnails, I get a Blogger 404 error. Please email me (address on my profile page) and let me know if you have a blog that I can mention! Julia of Julia Sue's Stamping. Julia is another stamper who has been blogging since 2009! She is also a Stampin' Up demonstrator. You will love her cards and tutorials and the passion that she has for this incredible hobby. As a designer and award-winner, she has tons of inspiration waiting for you! I may not be on again for a couple of days. I am off to have my head eyes examined and for various reasons, it takes my eyes a long time to recover from dilation. I was an unruly pupil as a child and the pupils in my eyes act out in the same way! When I get home, they will go straight to the Naughty Chair! HURRY, THE CHALLENGE CLOSES AT NOON PDT ON FRIDAY! Lovely card for your friend. I hope is only temporaly but It is not good. Oh this is sooooo pretty!!! I love the fun papers and bow and the party hat is just too cute! Hope your eyes recover quickly from dilation! Sorry they take their own sweet time about it! Terrific card Darnell. Very festive and colorful. Is that cocktail alcoholic or non-alcoholic? I know hammy mixed it. Beware. Fermented Kale juice packs a punch. LOL. Never drink and drive. That is a wonderful card design. Such gorgeous colors. I hope your eye exam goes well and I understand how the dilation can affect you. I suffer for only a day with problems, but sometimes it gives me a big headache for awhile. Take care. Love all the bright colours Darnell - sure your friend loved it. Hope the eye exam goes ok, you've reminded me I need to make an appointment for mine. What a celebration of a card!!! Love the pops of purple and hearts!!! That green bow, scrumdillyumptious for sure!!!! FUN, Sweet and sch a celebration!!! Thanks so much Darnell for joining in the Fun at The Challenge!!! Hi Darnell. just catching up with all your fabulous cards. This is such a fun design and super olours. Super snazzy card, love the images and papers. Very pretty card for Barb. She is going to love it. What a darling card. I love the papers and the colors and your friend Barb is sure to love it. And LOL about the pupils. Here's hoping your appointment goes well. Totally gorgeous Darnell, I love the papers and wonderful detailing. Fab design, Darnell - it literally is a party on a card! Barb will love it and your thoughtfulness :) Hope all goes well with your eye check. PURPLE and POLKA DOTS,only two of my most favourite things!! Love your colour combo Darnell this is definitely a foo-foo fabulous card, and I wish Barb a Happy Birthday too. You and Hammy did well on your party hardy card. I'm glad Hammy is back and has that out of his system. He needs to stay home and help "mom". Great card today and I'm sure Barb will love it. It has happy celebration written all over it. What a festive little card this is, Darnell, love it! I could use a martini right about now, it's been a heckuva day lol! opera tuna tea...sure wish my brain worked like yours cuz you are one heck of a fun, fun lady! Awesome job picking up the colors from the DP! LOVE the celebratory tag, all decked out ready for a party with some really cool ribbon and the coolest 'best wishes' embellie! Fantastic and fun, fun card! She's going to love it. Good luck withe the eyes....never a fun thing to do! Definitely a party card here Darnell! Fab! Oh, I love all the purple together with the other colours on this card, Darnell and the little red cherry is just so cute!!!! This card says PARTY (all day long)!!! Your friend surely loved and apprediated it!!! Fabulous card Darnell, and so festive. I love the papers and colours. wonderful card, Darnell!! what a cute party hat!! lovely embellishment! Now talk about a party on a card! This is so stinkin' fun and so very festive, I love it. Oh my goodness, Darnell ~ This is the most beautiful card EVER!!! I am so touched that you thought of me on my birthday and that you took the time to create such a fun and beautiful card!!! Thank you, thank you, thank you so, very much for this really special card...You have truly made my day, and I never get excited about my birthday!!! I had tea with my mom and dinner with my best friend and life partner ~ The hubby! So blessed to have them and 'you' in my life! Thanks again, kiddo!!! What a fun card!!! I know she is gonna love it!!! You just make me smile every time I visit! Love your card! It sure does scream celebrate with that wonderful cocktail! 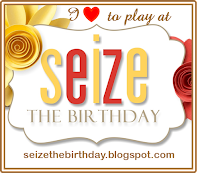 Thanks for sharing your amazing work with us over at Seize the Birthday! Have a great day! Love this birthday card, Darnell! The little pieces you added on top really make the card. I love that background paper--both of them! Super fun card for your friend! She's going to love it! This card is awesome sauce - your friend is such a lucky girl!! Way to go on creating something that will be sure to make her smile!!! Fabulous card!! Love the colours too! So glad you too the opera tuna tea to make this delightful card for Barb; she'll love it, as do I! You've worked magic with purple, with the layout (Lesley will be thrilled you're joining two of her challenges!) and the celebratory images. Amazing card for an amazing friend created BY and amazing friend! Love that kind of math! Adorable card, Darnell! Will have to check out the new challenge when I can actually get cards made--some day, I hope! Fun and festive--perfect for a birthday! Love the color scheme you used. Thanks for joining us at The Challenge! Foo Foo Fabulous indeed! I love that there is a party going on in this card's head and now that I've seen it I think there is a party going on in my head too. I love the busy-ness of this card, it makes it so festive. Happy Birthday dear Darnell, Happy Birthday to you!! !